“broody”–physical/emotional state of a hen or duck in which is she is prepared to sit on her eggs until they hatch. Can also include the time during which she is raising her young ducklings or chicks. Generally involves the duck or hen viciously attacking you should you come near her eggs or her young and can include you and all 4 children needing to work together to pry her out ofthe nest box in order to remove her and gather her eggs. 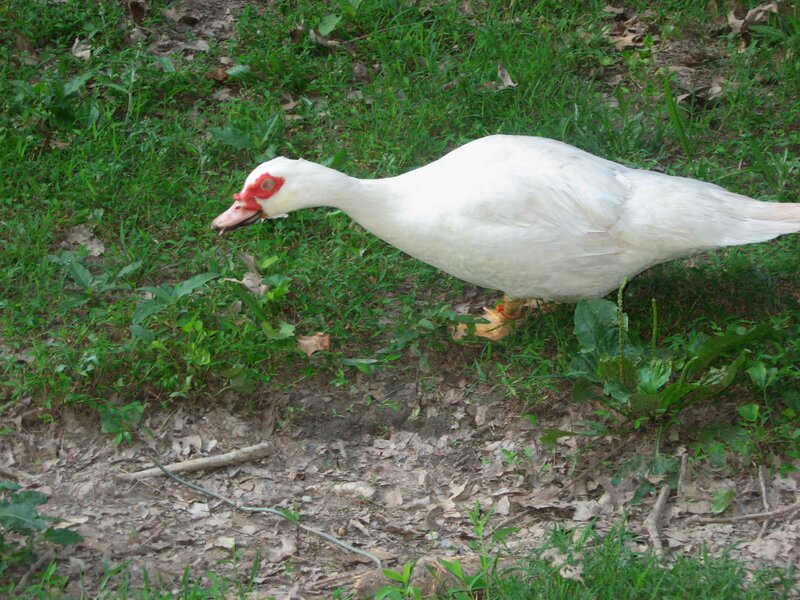 “setting”–when the hen or duck is actually sitting on her eggs in order to hatch them. Why isn’t it called sitting? I have no idea. Perhaps, to make farming seem like a fancy inclusive profession where normal people cannot understand the terminology while in reality no sane person wants to be tied down to their house every single day in order to let the ducks and chickens out at dawn and lock them back up at dusk. 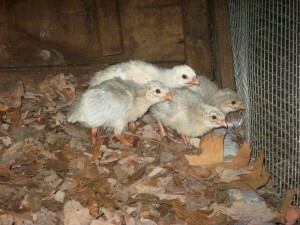 “keets”–baby guineas. Why are they called keets? See explanation under “setting”. “co-mothering”--a term we use at Woodland Pond to refer to two ducks sharing the setting of eggs. This is often very successful, allowing the eggs to remain warm while one mother goes off to swim or eat. It is also very helpful when the young are out of the nest and free ranging as they have 2 responsible adults to guard over them. Occasionally, one of the mothers will only remain with the young until they are old enough to free range. Then she will go a for a long swim on the pond and return to the bam yard acting like she has never met the other mother or seen those ducklings before in her life and resume her single lifestyle, yakking it up with the other females by the water trough and hanging with the males in the bushes. I hear ya, sister. April l8th, 2009. Eleven broody ducks nesting in duck barn. All is calm. April 21st. Discover a Buff Orpington hen sharing a nest with a duck. Remove her promptly as co-mothering between species in not encouraged. Chicken eggs only take 21 days to hatch. Duck eggs hatch after 38 days. Do not want to deal with these types of complications. April 22nd. Discover same Buff Orpington hen sharing a nest with a duck. Remove her again with a scolding. April 23rd. Discover same Buff Orpington hen in duck nest. However, she has now pushed the duck into the comer of the nest box, off the eggs. Remove her with a scolding. April 24th. Discover same Buff Orpington hen in duck nest. No sign of the duck. Upon seeing me, hen puffs out all her feathers so that she is big enough to fill up the entire nest box. Isn’t that funny? Call children over to see how funny she looks. Decide she is just like a big marshmallow. Laugh over the name Marshmallow. Remove her from the nest and receive a vicious peck in the process. Not really so funny anymore. duck nest box. Hate Marshmallow fiercely. April 26th-29th. Remove Marshmallow each night from nest box with a hoe. May lst. Decide a new month calls for a new plan. All Marshmallow needs is her own nest. Gather some chicken eggs from a neighbor’s farm, build a nice nest of hay and eggs in an unused rectangular pen. Congratulate myself on a plan that will allow the duck back onto her nest and let Marshmallow hatch out a bunch of new hens for me without me doing any of the work. Sweet! Go into duck barn and remove Marshmallow from nest box with a hoe. Throw out chicken food in the barnyard and prepare to catch Marshmallow and put her into nest I have prepared for her. Forget that all of my Buff Orpington chickens are the same size, color, and shape. Marshmallow is effectively camouflaged against capture among all the Buff Orpington hens happily eating their dinner. Bemoan that the little details always get lost in my big plans. Discuss with daughter which chickens look most likely to be Marshmallow. Choose 3. Lock all 3 into pen with the new nest. Declare to children that due to her broodiness, in the morning Marshmallow will be setting the eggs and we can release the other 2 non-Marshmallows. May 2nd. All 3 Buff Orpington hens stand smashed against the wire of the pen waiting to be released. Eggs sit neglected in their nest. Much weeping and gnashing of teeth. Release the 3 hens. One hen makes a beeline for the duck barn and gets into duck nest. Aha! Grit teeth against the coming ordeal, remove the self-identified Marshmallow from duck nest and, screaming, carry her pecking, clawing, puffed-up-to-the-size-of-Godzilla body from the duck bam to the pen. Slam pen door, triple lock it and leave her with the eggs. May 3rd. Marshmallow begins setting the nest. I win. Tell children to make note of the fact that with the proper planning and persistence, anything can be accomplished. Children ask if crying and screaming are a necessary part of the process. I assure them that it is. May 26th. Realize Marshmallow’s eggs are not going to hatch. Must be infertile or were too old or too exposed to weather before I collected them. What should I do with Marshmallow? Decide to wait until June as I am too exhausted at the end of a month to start anything new. June 2nd. Must track down a supplier of guinea eggs. Will place under Marshmallow and she will hatch the eggs and raise up some tick-eating, alarm-sounding guineas for me without me doing any of the work. Brilliant! June 3rd. No one closer than 3 hours away has guinea eggs available. Apparently guineas eggs are hard to come by as adult guineas tend to go wild, refuse to be locked into barns or pens at night, will not lay in nest boxes, and just get picked off gradually by nighttime predators until they are all dead and you have to buy some more. What a perfect addition for my farm! I must have guineas! Share this information with husband who simply shakes head and walks away. June 5th. Find out the local feed mill has tracked down a supplier of guinea eggs, is incubating them, and will have keets for sale soon. thinks it is possible. Several farmers share stories of hens attacking and killing keets, ducklings or other poultry placed underneath them. Non-farming friends remind me there are several effective brands of tick spray on the market that do not require hatching or raising of anything. Some idiot just suggests letting Marshmallow out of the pen, throwing the old eggs away and see if she’s done being broody. Check the internet and read many online stories of how a broody hen will successfully raise other breeds of poultry. Decide the intemet is never wrong and proceed with plan. June 11th. Go to feed mill for goat feed and come home with goat feed and 10 cute little keets. Put keets in brooder box under heat lamp in dining room. Run over and over Operation Mother Hen in my mind. Step 2. Remove eggs from under sleeping, non-resisting Marshmallow. Step 3. Place keets under her in place of eggs. Step 4. Sit quietly sipping coffee and reading book next to pen until the sun rises. Step 5. Observe what Marshmallow does carefully to ensure that she does not begin to peck keets when she gets up. Step 6. Tell friends how wonderful it all went and how Marshmallow is happily caring for keets. June 12th. Rise at 4:45am. Make coffee, gather book, flashlight, and lawn chair and take outside next to Marshmallow’s pen. All is quiet. Return to house and check on keets who are happily eating and drinking in brooder box. Wrap keets in a towel, place in a pot, and carry out to pen. 4:55am. Open pen and reach for eggs under Marshmallow. Forget that Marshmallow has a mean peck and is not afraid to use her talons either. She is not sleeping and is extremely resistant. Nix Step 2 of plan )removing eggs). Proceed to Step 3. With one hand, hold a stick close to Marshmallow’s head to receive all her pecks. With other hand, begin placing keets under Marshmallow. Several keets make a break for it, dash out from under her, and begin racing around the pen, peeping hysterically. Forgot to account for unreasonable keet behavior. Marshmallow is not completely blocked by the stick and several keets receive an unwelcoming peck as I put them under her feathers. Gather the panicked keets scurrying around the pen that did not follow the plan and put them under her tail feathers, furthest from her sharp beak. Remove the stick and quickly close the pen door. Listen in the darkness to a disgruntled Marshmallow pecking a keet every once in a while and the keet peeping hysterically in response. Tell myself she needs a few minutes to settle down. Wait, sweating and heart pounding, trying to decide if she’s pecking them more frequently or less frequently. move them directly into the warm spot under her abdomen and spread wings, where chicks and ducklings usually hang out under their mothers. Slam door and sit leaning against it, trying to decipher the sounds in the darkness. Quiet. A bit of ruffling of feathers. No peeping. No pecking. I win? 4:57-5:11am. On to Step 4 and 5. Use flashlight to read a bit in book. Sip coffee. Keep an eye on Marshmallow. In in the dim predawn I can see that she has spread her wings to cover the keets. Occasionally I see a head peek out from under her wing. However, if a keet comes to the front of her, Marshmallow will give it a fierce peck. It will run peeping back to her tail feathers and slide underneath her from the back. She does not resist this. I think she is just getting accustomed to the idea of babies. Or perhaps she is trying to insist they stay warm. A bit of tough love? I am unsure of her motives so begin using Jedi Mind Trick. This can work. It can. It can. It can. It can……. 5: 12am. Sunlight in the woods. Marshmallow rises, begins pulling keets out from under her one at a time and pecking them horrifically. Realize she is the maniacal witch I always believed she was in my heart and rush to pull her out of the pen. Also realize I will never get to Step 6.
from the crowd in the next few minutes will prove difficult. Do not panic. Do not panic. ready for Moms Night Out. I survey the chaos in the pen and can no longer remember why I thought it was a bad idea to just let the damn chicken sit on eggs in the duck barn. I am about to commence the weeping and gnashing of teeth. rush out from under the towel. The keets stop their peeping, Perhaps they are all too stunned to respond. I will not peek and risk upsetting the duck or releasing any keets. I will just wait quietly. 5:18am. I peek into the nest box. Stupid White Duck has spread her wings to cover the wooden eggs and all 10 keets. She looks at me blankly. I smile back at her. I resolve not to peek into the box again today and head back to the house. What do the city folks do with their time? © Stevie Taylor 2010. All Rights Reserved. Category: What do the city folks do? So funny! I totally enjoyed this and was laughing like a maniac as I read it at breakfast (in a restaurant). I am currently raising 7 keets as a first time bird mom so I could readily picture all that was happening. Great writing!